Born Costanzo Scappiticcio, Tino Luca was one of a family of 14, four of whom died at an early age. He acquired the first name Tino as an abbreviation of Costanzo, and the surname Luca after his father’s first name, which was far easier to pronounce for non-Italians that his actual surname. At Musselburgh Grammar School, the young Tino was known for his strength and physique and latterly became a prominent member of the school rugby team. Even as a boy, he worked in the family ice-cream business and learned to drive at an early age. However, he was not drawn to study. Called up in 1941, Tino joined the Royal Signals as a driver. During his army service, he was present when the push to liberate North Africa began under Operation Torch. Tino’s unit landed in Algiers, from where he was to drive trucks carrying large ammunition shells to the front line in the battle against German troops under Field Marshal Erwin Rommel. This involved driving through a featureless landscape at night in convoy, often guided only by the glow of the exhaust of the truck in front, carrying a cargo which, if it exploded, would have killed everyone in the convoy. Tino later landed in southern Italy with the Allied invasion force and served as the British Army fought its way northwards. During the long battle of Monte Cassino, Tino was again involved in delivering ammuntion to the front line, this time under heavy bombardment. He carried out this duty conscious that his own Italian relations were suffering the ravages of war, as his father’s family came from Cassino itself. As the Second World War was drawing to a close, Tino followed the fighting into Austria where he spent the rest of the war transporting soldiers and refugees to various destinations, whether to fight the retreating German forces, or to find safe haven from battle. 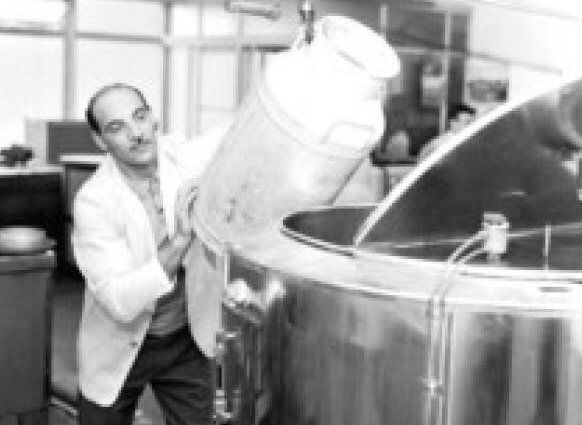 After demobilisation Tino returned to the family business, where he maintained the extensive range of equipment and took charge of the production of the famous Luca’s ice-cream. This became his life’s pleasure and absorbed him completely. Any breakdown or problem that arose was a challenge which he revelled in resolving. Throughout his working life, a host of friends would call requiring his help, for instance with fixing their cars or other machinery. Working for the sake of his friends was a joy to him. He was on duty from early morning to late at night. His first concern was the production of ice-cream, which started at 4am, when the milk arrived. The secret to high quality ice-cream, he insisted, was having the best of ingredients. When he took time to relax, Tino one of the many guitars owned by the family. He turned his skill with his hands to building his own guitars from scratch. Tino’s father, Luca Scappiticcio, was born in Italy and grew up in Cassino. He came to Edinburgh as a young man and married Anastasia Valente, who had also emigrated from Italy. Luca first worked as a hairdresser in Leith, and then worked in the kitchen of the North British Hotel where he learned the secrets of ice-cream making from a Swiss chef. In 1908, Luca opened the Olympia Ice-Cream Parlour, by which time he and Anastasia had four children. The Olympia immediately gained a reputation as a high-class ice-cream parlour and attracted a similarly high-class clientele. From a young age all Luca and Anastasia’s children worked in the family business, which gradually developed into a large wholesale ice-cream business. Additional shops were opened up in Craigmillar and in North Berwick, and soon three ice-cream vans were visiting tourist sites and popular events. Pride of the family was the Rolls-Royce reputedly bought from a Spanish nobleman and converted into an impressive showpiece for selling their wares. Tino married Nina Valentine, a member of another prominent Edinburgh Italian family, who persuaded a reluctant Tino to go on holiday to Italy to visit their family roots. Sadly, Nina died after some 15 years of marriage, leaving a distraught Tino with two young daughters to bring up. With the help of his large extended family, Tino raised his two daughters and absorbed himself in his workshop when he had any time to himself. He enjoyed good health but suffered a heart complaint in later life, which still did not deter him from working on until he was 88. In his last two years his otherwise robust health deteriorated. He passed away peacefully and is survived by his daughters Sarah and Rachel and two grandchildren, of whom he was immensely proud. Tino’s sister Beattie ran much of the business during the family’s golden years and was very close to Tino. She was known and loved by everyone who visited the family shop. Tino outlived the rest of his 14 siblings: Annie, Vera , Philip, Angelina, Beattie, Ida, Victor, Nina, Tino, Angela, Lena, Raymond, Yolanda, and Leo. Thank you for writing about Tino. I remember him very well from my childhood, when my parents would take me to Lucca’s on our weekend trips to Musselburgh. He was a lovely man who always had a cheerful and welcoming smile and he obviously loved his work. They say that Italian’s cook with love and Tino obviously put a lot of love into his work. The ice cream was so delicious and I have never tasted better. It is so lovely to hear about his life and I thank you, Helen, for making this great website and remembering all the sweet souls like Tino. God bless you.